Northern California residents are used to dealing with large-scale wildfires erupting near and within their hometowns. However, this past October saw dozens of extreme wildfires simultaneously sweeping across Napa, Sonoma, and Solano counties (Holthaus, E., 2017). Soon after these eruptions, thousands of people were forced to evacuate their homes, 1,500 structures had been destroyed, and eleven people were reported dead. Governor Jerry Brown promptly declared California in a state of emergency making the National Guard available. After one week, one of these fires named the Tubbs Fire, became California’s most destructive wildfire in history, taking 21 lives and destroying 5,643 structures (The California Department of Forestry and Fire Protection [CALFIRE], 2017). Thousands of wildland firefighters worked day and night attempting to contain this fire, only receiving on average three hours of sleep a night (Westervelt, 2017). Ultimately the wildfires were uncontrollable, subsequently destroying thousands of wineries significantly hitting local economies. California Lt. Gov. Gavin Newsom stated that enormous fires interfacing with high population areas is unfortunately the new norm. Just this year, California fires have burned twice as many acres than 2016, and the average amount burned over the past five years (CALFIRE, 2016). Contrary to popular belief, low severity and frequent wildfires that occur every 1-25 years are key to perpetuating healthy stands of certain forest types, especially in the western U.S (Pacific Northwest Research Station, 2015). Just one hundred years ago, the Northwestern forests contained many gaps in their canopies, and their understories were not very dense (Hessburg et al, 2005, p. 117). Low severity fires sculpted these forests by keeping the buildup of vegetation at bay which created breaks in continuous fuel, also known as combustible vegetation (Washington, G.W). Breaks in fuel deter mega fires from spreading across the landscape (Hessburg et al, 2005, p. 132). 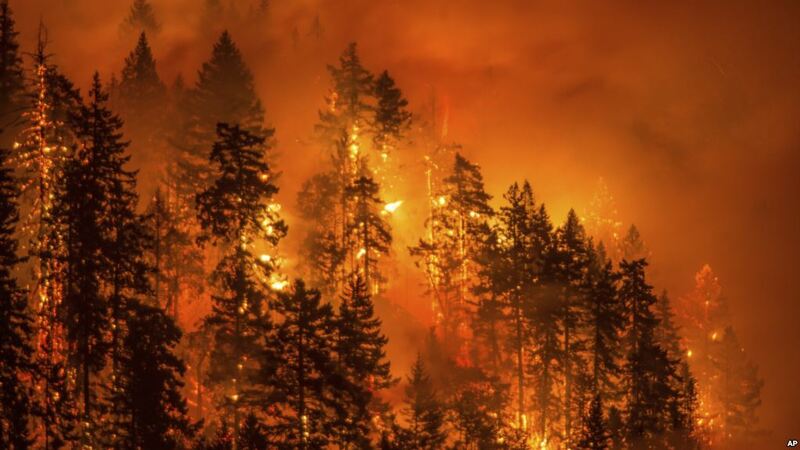 Fire is imperative to forested ecosystems of the Pacific Northwest because it not only reduces stand density and accumulation of vegetation, but there are many ecological benefits such as nutrient recycling, reproduction, and germination, (Hessburg et al, 2005, p. 118). Approximately a century ago, the U.S. Forest Service (USFS) began putting these important fires out leading to a plethora of excessively dense stands with continuous, built-up fuels (Stephens et al., 2012., p. 549). The USFS were allotted money from an emergency fund allowing them to fight fires without chewing into their own budget (Houtman et al, 2013, p.A) During this century, the West entered a period of intensive logging where the largest trees were repeatedly cut, and many small trees all filled the gaps left behind simultaneously, cutting system called highgrading (Hessburg et al, 2005, p.120; p. 122). Years of fire suppression plus highgrading has transformed the forested landscapes of the Pacific Northwest to be now overly stocked stands, or groups of trees with uniform characteristics, of similar age (Snyder, M., 2014). Wildfires in the US have been strongly affected by all aspects of global climate change. Climate change has altered current atmospheric patterns especially average air temperatures significantly impacting fire regimes (Huang et al, 2015, p. 89). Warming means that regions will experience drier than normal conditions conducive to extreme fire outbreaks (Harvey, C., 2017). The amount of moisture in vegetation decreases under warmer conditions because of a decrease in relative humidity, and an increase in evapotranspiration rates, or the process in which water is transferred from the land and foliage to atmosphere through evaporation (Huang et al, 2015, p. 89). Wildfires feed off dry fuels because fuels with lower moisture levels take less time to burn, therefore making wildfire behavior more erratic and unpredictable (Flannigan et al, 2009, p. 492) Studies show that in response to drier climatic conditions, the frequency of large fires in the Northwestern US has increased by 1000% since 1970 (Schoennagel et al, 2017, p. 4538) Warming also increases fire severity in being a sharp increase in the amount of area burned in future predicted fires. In fact, this year alone has seen approximately a 23% increase of acres burned nationally compared to the average amount from 2006-2016 (National Interagency Fire Center [NIFC], 2017). Not only do extreme wildfires kill off enormous amounts of trees, they also destroy thousands of homes and structures annually. Since 2011, there has been eleven wildfire outbreaks each causing at least one billion dollars in damages (Center for Climate and Energy Solutions, 2011). This October, over 20,000 citizens were evacuated from Santa Rosa California and the neighboring communities to flee from the devastating flames that destroyed everything in their path (Fuller et al, 2017, October 10). Due to past land use history coupling climate change, management through prescribed burning must be implemented at a fast rate to reduce the accumulation of dry fuels, or this megafire trend will only continue to worsen. One of the most common means of managing forest fires as mentioned before is through prescribed burning. This is where a section of the forest, typically the understory, is purposely ignited to allow for the reduction of fuel to ultimately decrease the size, severity, and frequency of wildfires. (United States Geological Survey, 1999). This is usually done by small federal or state-level ground crews that are trained to maintain control of the fire. This form of management may not work on all landscapes, however it is a proven method in reducing fuel loads effectively. On the coast of Southern Alabama, multiple prescribed burns were administered every 2-3 years in a Longleaf Pine dominated forest (Outcalt & Brockway, 2010, p. 1615). After eight years, the resulting forest structure and composition consisted of an open Longleaf Pine dominated overstory with a reduction in a woody understory and increase in an herbaceous layer (Outcalt & Brockway, 2010, p. 1622). This description is an ideal Longleaf Pine ecosystem because the build-up of a woody and dense understory heavily increases severe wildfire risk. Much of the public is concerned about prescribed burning due to a lack of understanding. Some people fear of the chance prescribed burns might go awry and become impossible to contain. However, during the period of 2002-2006, the USFS could not contain 38 out of 3,640 controlled burns performed, which is a 99% success rate (Deirdre, D & Black, A., 2006). Considering how damaging wildfires can be, the chance of a prescribed burn becoming uncontrollable and destructive is quite negligible. Due to negative opinions regarding prescribed burning and political constraints, there has not be and is not nearly enough prescribed burning being conducted throughout the U.S., especially on Pacific Northwestern national and state forests. After thirteen years, the USFS did prescribed burning on only 4.7% of Oregon’s 15.7 million acres of national forests and administered an even slimmer 1.4% of Washington’s 9.3 million acres (Brunner, J & Bernton, H., 2015, October 20). When broken down by region, of the 11.7 million acres burned using prescribed burning in 2014, the Southeast burned 8 million acres, 69% of the total amount performed throughout the U.S. When compared with western agencies, they only performed 27% of the total acres burned (Coalition of Prescribed Fire Councils, Inc., 2015). With the expansive amount of information covering the effectiveness of prescribed burning, the question remains why the West is conducting significantly less prescribed burning than the South. Part of the reason lies in fire being an accepted component of southern culture, in fact many southern laws support prescribed burning being done on private property by private non-commercial practitioners and private contractors (Kobziar et al, 2015, p. 565). 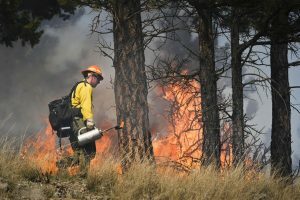 There are much stricter laws in some regions of the Pacific Northwest limiting the amount of prescribed burning allowed. For instance, the Clean Air Act requires the EPA to enforce states to mandate certain levels of six common pollutants determined by the National Health-based Ambient Air Quality Standards (Engel K.H., 2013, p. 647). For states implementing significant amounts of prescribed burning, the EPA enforces them to carry out smoke management plans (SMPS) that include ways of minimizing smoke from prescribed burns and topics such as what agency will authorize burn permits (Engel K.H., 2013, p.656). 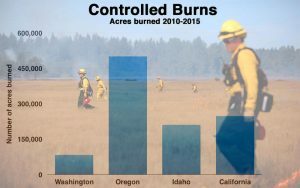 As mentioned earlier Oregon is conducting more prescribed burning than Washington state; Oregon federal and state agencies burned over 450,000 acres between 2010-2015 while Washington state and forest agencies burned less than 150,000 acres (Banse, T. 2016, February 3). Washington State Senator Linda Evans Parlette told the Northwestern News Network that the answer lies partially in these strict smoke management laws the Washington Department of Natural Resources (DNR) imposes on the agencies and people of Washington. To get a prescribed burning plan approved in the state of Oregon, an agency or forest landowner must submit it to the District of Forestry state forester (Battye et al, 1999, p. 101). In order to get a plan approved in Washington state involved a lot more steps: agencies doing prescribed burns of 100 tons of fuel or more, which an average timber burn exceeds, must submit a permit to the DNR complete with pre-burn data and steps for collecting post-burn data (Battye et al, 1999, p. 141). In addition, the DNR region manager must screen the burn site and review the atmospheric conditions the day before the scheduled burn. Finally, the region manager must provide the final approval the day of the planned burn (Battye et al, 1999, p. 142). A solution to these inflexible smoke management laws that date back to the 90’s is modifying the clauses within each state’s’ SMP to allow for more prescribed burns to occur, especially in the west. House Bill 2928 is a bill recently passed by Washington State Legislature in March 2016, aiming to make prescribed burning authorization more lenient (House Bill 2928, 2016). In summary, the bill calls for burn plans to be approved 24 hours before the scheduled burn as opposed to the day of. In addition, it reclassifies prescribed burning as “forest resiliency burns” allowing for controlled burns to be conducted on days that regular outdoor fires are prohibited. Finally, the bill states that burn permits can only be revoked by the DNR when the prescribed burn is highly likely to result in heavy air quality violations or other safety issues. 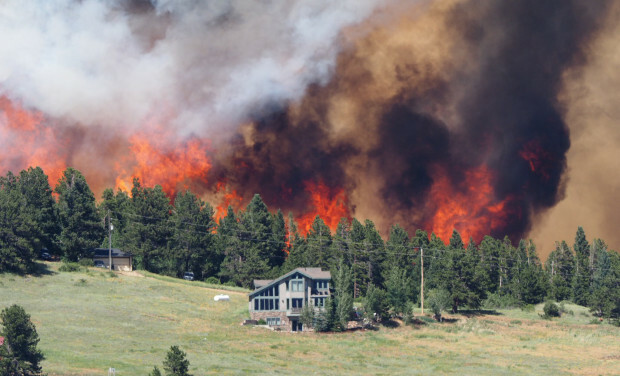 With projected warmer temperatures and less precipitation in the future due to global climate change, wildfires will likely increase in many areas of the country, especially of those in the western United States. However this does not necessarily have to mean that the severity of these wildfires has to increase as significantly as projected. Prescribed burning offers an effective treatment to reduce hazardous fuel loads. Moving towards the future we must increase knowledge of the public and politicians on fire ecology, which is a natural process in many western ecosystems. We also must pass bills that concentrate around the initiative that fire management, both proactive and active, is needed and will be needed even to a greater extent in the future. If this does not happen, key funding and initiatives may be lost because costs will only increase with more frequent, high severity wildfires. Fire has always been a part of the Western United States ecology and with the changing climate, precautions must be taken to insure low severity prescribed burns are administered to reduce the likelihood of frequent and severe wildfires looking towards the future.